RUGBY LEAGUE: Warwick Cowboys coach Phil Economidis will start thinking about finals footy now his A-grade side is certain to make the finals. A 36-14 win against Gatton on Saturday night at Father Ranger Oval secured the finals spot. The Cowboys won three of the four games against Gatton. Economidis said collectively all his players were good in the win against Gatton. "We can now concentrate on the semis as we have secured a spot,” Economidis said. Centres Dylan Galloway and Joe Fuimaono and prop Darren Pettiford were three of the best for Warwick along with halfback Ben Sullivan. "Ben works on the left in attack and Dylan on the right so we have two options,” Economidis said. Warwick won reserve grade 23-22 to maintain a strong run to the finals while the Cowboys went down in the under-18 game 34-16. 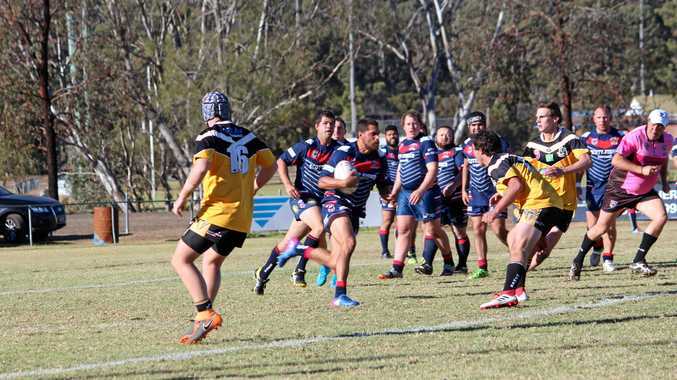 The Cowboys started the day in second-division with a 26-10 win so the club has A-grade in the final, second-division close to securing a spot and reserve-grade hitting top form in a battle for a finals spot. Warwick has 10 wins and four losses in A grade, two to Dalby and one to Wattles and Valleys. The Cowboys have a bye this week then play Valleys at Herb Steinohrt Oval and Brothers at Father Ranger Oval on the following two Sundays. Bart McIntosh landed the winning field goal and was the Cowboys players' player in a 23-22 reggies win against Gatton. Michael Dennison was best forward and Brent Osborne best back. Two development officers from Redcliffe Dolphins will run the Cowboys A-grade team at training on Tuesday night this week.